Photo Courtesy of : Flat-Coated Retriever Society of America, Inc. The Flat-Coated Retriever was once considered a generic "Labrador" type dog, called a "Retriever Proper." This breed was developed in the 1800s from various retriever and spaniel water type dogs such as the Newfoundland, Irish Setter, Labrador, Water Spaniels and possibly the Collie. Some of these dogs were born with a flat, wavy coat and eventually they were categorized as a separate breed becoming the Flat-Coated Retriever. The Flat-Coats became very popular until the beginning of the World War when their numbers dwindled and their popularity never reached those high numbers again. More people choose to own a Labrador Retriever or Golden Retriever because they are cheaper and easier to find. The dogs were used by fisherman and hunters. They have a superior sense of smell, are excellent swimmers, and are able to work well in marshy areas. They are wonderful bird dogs, doing very well retrieving on plains and in areas thick with trees and bushes. The Flat-Coated Retriever was recognized by the AKC in 1915. 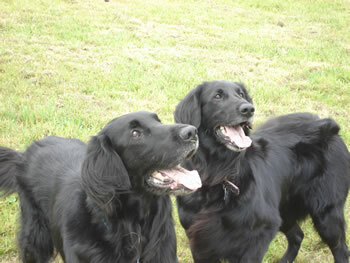 Some of the Flat-Coated Retriever's talents are retrieving, hunting, tracking, watchdog and agility. •	A dual-purpose retriever of game on land and from water. •	A high-energy dog ~ requiring 60-90 minutes/day of exercise. •	Make a great dog for joggers, runners, hikers and bikers. •	Mature slowly ~ puppy like for several years before maturing. •	A lot of fun, clown-like, entertaining companion. •	Friendly, loves everyone, great with children and other dogs. •	Great watch dog, but not a great guard dog. •	Not suited for apartment living. This is a hunting dog ~ needs lots of ground to run and exercise on. •	Best to live in an environment where his talents can be exercised ~ running and swimming. •	Not the best choice for homes with seniors or young children. Too rambunctious. •	Known for eating their own poop ~ which is called 'coprophagy'. So pick it up! •	Considered to be a healthy breed. The Flat Coated Retriever is affectionate, energetic, and loving. It is an excellent companion for families with children, and makes for a good protective dog as well. It is stable, smart, and tends to stand strong during times of tension. This one smart dog ~ active, and friendly and bonds well with its owners and family members. It is often over-attentive to guests and strangers, and may come across as too strong at times. Still, these dogs are gentle and playful and enjoy keeping their owners and company happy. The Flat Coated Retriever is a hardworking and generally healthy breed; they have a naturally strong stamina and will stay most healthy with plenty of Exercise and rest. Still, it is important to note that cancer is quite common in this breed. The Flat Coated Retriever needs very little trimming but regular weekly brushings whenever possible. Their coat needs to be kept nice and tidy on a regular basis, especially after they have been outdoors for extended periods of time. The Flat Coated Retriever needs daily exercise at least once or twice per day. Running, walking, jogging, sprinting, and playing with a Frisbee are ideal activities for this dog, and they make excellent jogging companions regardless of the weather. These dogs especially enjoy swimming and hunting, so taking them out to the forest or parks on a weekly basis will give them plenty of new environments to explore. These dogs also enjoy car rides, so taking the dog along on a camping adventure would be a real treat! Natural hunters, these dogs use all of their senses to enjoy a variety of activities. They have a tendency to follow their noses, but owners do not necessarily need to worry about this dog wandering too far as it will return home more often than not. Still, an untrained dog will need to remain on a leash during the majority of its excursions. These dogs are well-behaved and will listen to instructions quite well. It is important to train them consistently and encourage a variety of activities and exercises. These dogs are very playful and active, and are a joy to manage and grow with. Working flatcoats usually get their fair share of exercise, and enjoy taking part in a variety of activities. These dogs are easy to work and will train well as a gundog or hunter. The Flat Coated Retriever has been bred as a sporting dog and is very active by nature. These dogs love to please but they can be difficult to train at times. They are bored easily, so it is important they have enough variety in training and activities on a regular basis. The Flat Coated Retriever develops a strong bond with its owners and masters, and will require consistency and direction, especially in its younger years. This Retriever's personality can be best described as devoted and outgoing. This is helpful when creating a training program for this dog at any age. Using toys and other objects as part of training can help them grasp new skills relatively easily. Rewards of food, new toys, and even trips to the park can be helpful motivators. The Flat Coated Retriever will get bored very easily with repetitive tasks, and they may even become willful at times. It is important to pay attention to positive reinforcement and motivation so that they are consistent. These dogs do respond best to positive reinforcement on a regular basis, and they are particularly sensitive to harsh tones or mannerisms. They cannot tolerate harsh handling or correction and will simply retreat when they feel too anxious or uncomfortable. These dogs are naturally happy and exuberant; it is important to train them appropriately so that they do not knock over items in the house, or even run into small children. Socialization is very important, and obedience training will help them learn the rules of the household. These dogs can be quite affectionate and fun-loving, so it is important to set some guidelines and respect through constructive training. Training the Flat Coat Retriever as a working gundog is another opportunity to make the most of this dog's natural talents and abilities. These dogs are especially strong and have strong stamina; they have a natural ability to learn and will do well with consistent training out on the field. These dogs use their own air scent abilities to track down and hunt, and this needs to be encouraged whenever possible. Teaching the dog to 'heel' is the first step in training both puppies and fully grown dogs. The dog will come to understand the direction only after demonstration and ongoing repetition. Too much, however, will result in ineffective training. It is important that the puppy has learned how to 'follow' his mother, whether this is its real mother or simply the owner or master. These dogs do well by performing with a pack leader, and they are especially responsive to consistency. Incorporating games and play into training will help with the activities for the Flat Coat Retriever. These dogs thoroughly enjoy bonding time with their owners, and will respond well to continuous attention, reinforcement, and affection.